Want to see my new bookshelves? Here is a peek at my Ikea Billy bookshelves which take up one full wall of my studio/library. I’ve got four regular size ones and a thinner one I placed in the middle. On the far left my mysteries take up all the shelf space. The next one has classics, poetry and then the fiction starts about half way. 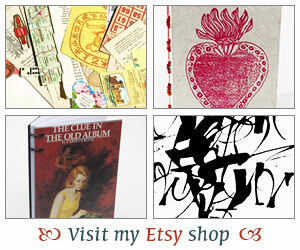 The middle section has my crafty books and magazines and the one-of-a-kind journals I’ve made. The next two bookshelves have more fiction books. At the bottom of the last bookshelves I’ve literary magazines and a keepsake box which holds my bookmark collection. You can also catch a small glimpse of my reading chair. Actually, that’s my husband’s reading chair but his studio is quite packed with tables and bookshelves so I told him I’d be more than happy to have his chair in my studio/library. It is so comfy I don’t know if I’ll give it back. Ha. A lot of my books are still in boxes. Most of my keepers, my Spanish books, some reference books and a few others. I plan to put those in another area of our house but we still don’t have bookshelves for those so unfortunately they’ll have to stay in the boxes for a while longer. Anyway, hope you are all having a great weekend. I’ll be busy reading and working on my favorites of 2009 list so I’ll be back with that soon. Beautiful! It looks like a place to sit down and stay a while 🙂 I love the skinny shelf – think I need one of those for the end of my row of Billys as well. And all that space…you are right, it is crying out to be filled with new books. Oh, I love it! Those bookshelves are great! Definitely looks like a comfy place to sit and read, read, read. Enjoy! You definitely need a reading chair to have close to those bookshelves! What a lovely wall of books–isn’t it fun sorting through them and organizing! I’m afraid that’s the only kind of cleaning I enjoy! Enjoy the last few days of the year and I look forward to your favorites list. oh my goodness!! I am super jealous!!! 🙂 beautiful new bookshelves, enjoy them! WOW! That is totally awesome. And to be able to see all the titles! I can’t imagine. I need to do a bookshelf overhaul! Anna – It’s a vicious cycle isn’t it 🙂 I figure I need to gift myself with a Christmas present and it’ll involve some books! Danielle – Ha,ha… I’m right there with you. That’s the only kind of cleaning and organizing I enjoy doing. Only when it comes to my studio. Unfortunately I’m terrible at the rest! bookworm – Thank you! I love ’em. Beautiful!!! So much space, and I’m completely envious. We’ve been looking at houses, though buying is still a bit our of our reach, and I’m planning the ultimate library. 🙂 Enjoy your space! Wow! Those are great! I have great shelves, but they don’t match. 🙁 Every time I get one I like they discontinue the design! Beautiful! I would love a room of my own for just my books. Maybe one day. . .
Oh my goodness! Those look spectacular! I just want to come and have a really good look at all your books now. 🙂 Looking forward to hearing how the book shopping goes – you do sound like a woman after my own heart! And a very happy rest of Christmas to you! I love your bookshelves. I have Billy bookcases too, at the moment I have only two, but hubby is going to get me two more after Christmas,as my books are double stacked now. Andi – Have fun looking at houses! We had a good time although towards the end I was getting to the point where I couldn’t remember things about some of the homes. haha… Planning my studio/library has definitely been one of the biggest perks. Kailana – Oh that has always happened to me. At our apartment I had five bookshelves and all were different and all falling apart! So I feel very fortunate now. Literary Feline – I agree. I told my husband that they needed more books because the blank spaces are just begging for more! vivienne – Oh I bet you are so excited to get more! You’ll have to show us pics when you get your new shelves organized. I like how you can have the extensions on the top too. I’m sort of tempted to get those later on! They look great! Thanks for sharing. Enjoy your organization and new library. I love it. Oooh, pretty! I’m jealous of those gorgeous shelves — enjoy! I love your bookshelves!!! And that is awesome that you have some empty spaces that you get to fill with new books!! Enjoy your new bookspace! I love that you have a bookmark collection. I have been holding on to bookmarks and not ‘committing’ to actually collecting them and that you have a special place for them on your bookshelf is wonderful. You have inspired me. Looks great! 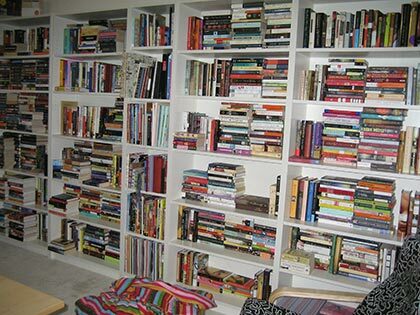 I had those same bookcases when I lived in the UK and they hold a lot of books, etc which is great. Hmmm, I wonder what books will fill those empty spaces in 2010?! Nikki – I hope you get your wall of books too! Nymeth – The chair is also from Ikea and at first I wasn’t very sure about it but now I love it! diane – it’s so fun to have them and all my books within easy access! Dorothy W. – I promise I’ll enjoy them! Kathleen – I was worried I wasn’t going to have space left so what a thrill to have some. Can’t wait to shop! Beth – I’ve been collecting them for years and just love it. I hope you’ll continue to grow your collection! Karen – I love this too. In some ways I would like to add another bookshelf to the bedroom and we do plan on adding more bookshelves to the living room area but it may be a while before that happens. I really liked the Billys so hope you’ll check ’em out. I love it. I love that you are storing your books horizontally and vertically. Only true readers with tons of books store them this way because that’s the only way they will all fit. By the way, I’m working on a tour for The Weight of Heaven by Thrity Umrigar. If you’re interested, shoot me an email! Those look wonderful, Iliana. I’d not seen the white Billy shelves before and now I think I like them best of all–wish I could add a wall of them in one of the extra bedrooms at some point. Kristy – I like having the books like that. It reminds of those used bookstores that are arranged all hodgepodge but look so inviting you know. trish – Ha,ha… I agree. More room for books! Oh I wish I could help out with the book tour but am just so behind on my reading so I’ll probably have to take a pass on it but let me think about it a bit. SFP – The other neat part about them is that you can put extensions on the top! More room for books. Or, you can also attach lights to the top. They are so neat. You can add doors, and just other cool things. Great to see you back and I was just thinking look how much space is in those shelves. You can go through and see where you need to fill in the gaps! I love looking at other people’s bookshelves – thanks for sharing! I just love Billy bookcases! Looks like you’ve made a lot of progress with those shelves…so what chair is that? is it from Ikea? Wow, that’s awesome! If only I could get some more bookshelves, LOL. Wow, Iliana, your bookcases look fantastic! I have a “wall of books” in my living room, but it’s made up of open-backed Ikea shelves, which unfortunately get very dusty! How did I miss this post?! I love your new bookcases!!!!!! I’m hoping to get a new bookcase for my office/guest room and can’t wait to sit and fondle all my books as I get them organized. Yours looks great. What fun! !